Easter is a very magical time at Clyde Park! Bring out the family on Easter Sunday, the 21st of April and let the kids enjoy face painting, arts & crafts, the huge egg raffle, meeting our roaming Easter Bunny and especially the Big Easter Egg Hunt. We also will have delicious brunch & lunch options, live acoustic music to enjoy for everyone and Single Block Wine Tastings and a Winery Walkabout for the grown ups. The Big Easter Egg Hunt on Easter Sunday our vineyard grounds is always so VERY popular and a lot of fun! To ensure it is enjoyable for everyone and each child gets a go, we have a limited amount of 250 tickets available to participate at the Big Hunt. The funds of the tickets will be donated to “The Change Angels” charity and all other activities like face painting will also be included in the ticket. Children can only participate with a ticket, 1 ticket per child. Tickets need to be pre-purchased. Please keep in mind SHARING is CARING. We may have a staggered start by age group, depending on bookings. Clyde Park will provide a standard size Easter Egg Hunt bag for all children. No other lolly bags to be used until after every child has enough time in the hunt. Clyde Park staff will give directions for this on the day. 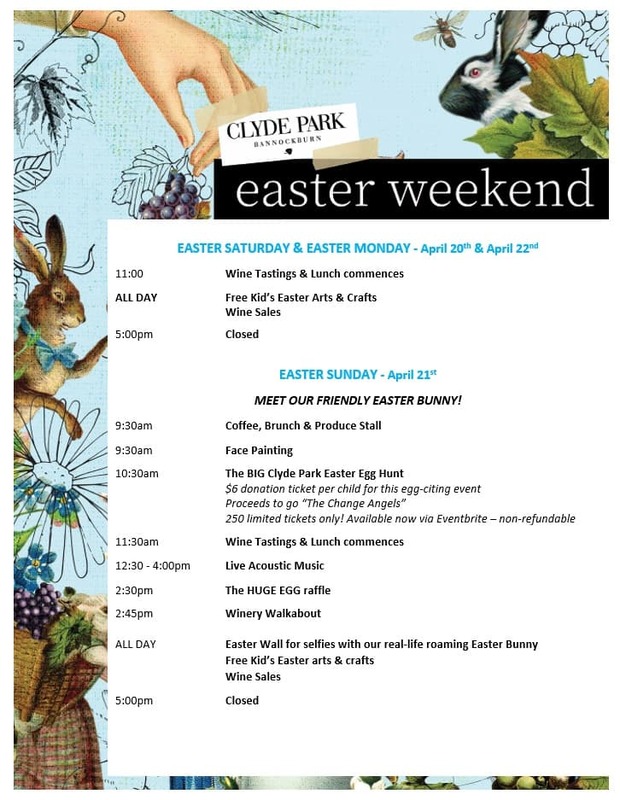 Please feel welcome to contact us at 03 5281 7274 or email to events@clydepark.com.au if you have any questions or queries. Enjoy a walk in the park with Clyde Park’s Viticulturist Luke Polson as he takes you through the vineyard tour looking at Clyde Park’s Block D Pinot Noir plantings, a stroll through our Chardonnay and Pinot Gris along the banks of the Moorabool River, stopping off at Clyde Park’s Vege Garden. Suitable clothing and footwear recommended. Another rare and amazing opportunity. Sunday 2:45pm, please allow 45 minutes.